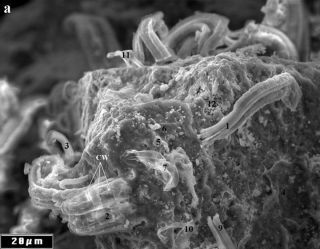 Filaments in the Orgueil meteorite, seen under a scanning electron microscope, could be evidence of extraterrestrial bacteria, claims NASA scientist Richard Hoover. This article was updated at 4:50 p.m. ET. The recent announcement by a NASA scientist of evidence for alien life in meteorites from outer space has created a firestorm of controversy that researchers say is unlikely to die down anytime soon. Astrobiologist Richard Hoover of NASA's Marshall Space Flight Center in Huntsville, Ala., used scanning electron microscopes to analyze slices of carbonaceous meteorites that fell to Earth from space. Based on the appearance of "filaments" and other features that resemble microbes, Hoover argues that the meteorites contain fossilized life in the form of cyanobacteria – single-celled organisms also known as blue-green algae. He supports this claim by presenting evidence of chemical compounds present in the meteorites that are consistent with a biological origin. These features in the Orgueil meteorite, seen under heavy magnification, could be evidence for life, or just random mineral formations. Hoover writes that the "the size, structure, detailed morphological characteristics and chemical compositions of the meteorite filaments are not consistent with known species of minerals," and that they must be evidence of single-celled life in the rocks. If true, the discovery would mean life in the universe is not unique to planet Earth – that it may have sprouted up multiple times in other locations, or even that Earth's life originated in space and was deposited on the planet by meteorites. "Because this would be a very important result if true, scientists are going to do what they should do: be skeptical," said astronomer Seth Shostak of the Search for Extraterrestrial Intelligence (SETI) Institute in Mountain View, Calif.
Shostak called the paper "an extensive and thorough review" of Hoover's findings, but said they did not amount to convincing evidence. "If you look at the microscope photos, they are certainly suggestive – looking like photos made of various terrestrial bacteria," Shostak told SPACE.com. "But then again, while intriguing, that's hardly proof. If similarity in appearance were all it took to prove similarity in kind, then it would be pretty easy for me to demonstrate that there are big animals living in the sky, because I see clouds that look like them." The same goes for the chemical evidence Hoover presents, Shostak said. While these compounds could have been produced by microbial life, they also could have been made by non-biological, mundane processes. The type of microbe Hoover claims to have discovered has also provoked some scientists' skepticism. Cyanobacteria live in liquid water and are photosynthetic, meaning they convert carbon dioxide into organic compounds using energy from sunlight. That implies that the meteorites would have had to contain liquid water exposed to sunlight, and also that high concentrations of oxygen would be present, said astrobiologist Chris McKay of NASA's Ames Research Center in Moffett Field, Calif. Such a scenario is unlikely based on researchers' current understanding of meteorites, McKay said. If they contain liquid water at all, it is likely in their interior, not on the surface, where it would be in contact with sunlight. McKay said Hoover's findings suggest that either the filaments in the microscopic images are chance shapes, or that the environments on meteorites were much different than scientists expect. He expressed respect for the overall methods of the study, and said Hoover had presented enough evidence that the structures present do come from the meteorites and weren't introduced as contamination after the rocks landed on Earth. "Richard Hoover is a careful and accomplished microscopist, so there is every reason to believe that the structures he sees are present and are not due to contamination," McKay wrote in an e-mail to SPACE.com. As soon as word of the paper was announced, some scientists were reluctant to give it credence based on the Journal of Cosmology's reputation. "It isn't a real science journal at all, but is the ginned-up website of a small group of crank academics obsessed with the idea of [Fred] Hoyle and [Chandra] Wickramasinghe that life originated in outer space and simply rained down on Earth," P.Z. Myers, a biologist at the University of Minnesota, Morris, wrote on his popular science blog Pharyngula. "It doesn't exist in print, consists entirely of a crude and ugly website that looks like it was sucked through a wormhole from the 1990s, and publishes lots of empty noise with no substantial editorial restraint." Myers also referred to the paper as "garbage." Rosie Redfield, a microbiologist at the University of British Columbia, questioned whether the journal's papers are really peer-reviewed, as it claims. "The journal proudly announces that it is obtaining and will publish 100 post-publication reviews," she wrote on her blog, RRResearch. "But did it bother getting any pre-publication reviews? It will be shutting down in a few months, after only two years of online publication (the 13 'volumes' are really just 13 issues). Its presentation standards are pretty bad – there doesn't seem to have been any effort at copy-editing or formatting the text for publication (not even any page numbers)." NASA confirmed that the paper had not been peer-reviewed. "NASA cannot stand behind or support a scientific claim unless it has been peer-reviewed or thoroughly examined by other qualified experts," Paul Hertz, chief scientist of NASA’s Science Mission Directorate in Washington, D.C., said in a statement. "This paper was submitted in 2007 to the International Journal of Astrobiology. However, the peer review process was not completed for that submission." Some scientists approached about the paper asked not to comment officially but said the research didn't merit attention. The editors of the Journal of Cosmology dismissed such attacks as "tantamount to school-yard taunts by jealous children," in a follow-up press release after the paper's announcement. In response to some critics questioning why the research wasn't published in the more prestigious journals Science or Nature, the Journal of Cosmology responded with a statement that "both Science and Nature have a nasty history of rejecting extremely important papers, some of which later earned the authors a Nobel Prize." "Science and Nature are in the business of making money," the journal charged. "The Journal of Cosmology, is free, open access, and is in the business of promoting science." This is not the first time that a debate has raged over possible evidence for life in meteorites. In 1996, researchers made a splash when they announced evidence for fossilized microbial life in a meteorite from Mars called Allan Hills 84001 (ALH 84001). The lead author of the paper announcing these findings in the journal Science was David McKay, a researcher at NASA's Johnson Space Center (not to be confused with NASA Ames' Chris McKay).The claim prompted giant headlines in papers around the world at the time, and even a statement from President Bill Clinton. But in the years since, scientists have questioned those findings — and most remain unconvinced that the meteorite offers conclusive evidence. "Prior claims for evidence of microfossils in ALH 84001 remain controversial at best, despite more than a decade of dedicated research by many groups and dozens of scientific papers on the subject," said planetary geologist Victoria Hamilton of the Southwest Research Institute in Boulder, Colo. "I'm skeptical that these new claims will be any less controversial or any more easily proven or falsified." Shostak said wariness after the Allan Hills controversy could be carrying over to this announcement. "The ALH 84001 result was based on photos and chemical evidence, much as the current story," Shostak said. "And I think that's a major part of the reason why many experts in this field are skeptical of Hoover's claim to have found life that cooked up in comets." Ultimately, this find, like the Allan Hills report, isn't enough to settle the score one way or the other. "Sometimes scientific results are ambiguous, and are greeted with the common (and rather uninspiring) refrain that 'more research is needed,'" Shostak said. "That's the case here. We need evidence from other approaches and from other researchers." Hoover's paper can be read at the Journal of Cosmology.